It's too bad that more players don't put a fraction of the effort into developing the mental game that they do into obsessing about their strokes. Let's face it, for a lot a players, it just gets too scary. Do you have the courage to actually take a hard look at yourself as a competitor? If you do, they you have the potential to raise your game, possibly by multiple levels. On Tennisplayer, we have the best coaches in the world who can help you do it. Jim Loehr virtually invented the concept of mental toughness. His work has been so seminal and so influential, that top pro players routinely model themselves on his work without even knowing the original source. Taking your time between points, learning to stay positive with your body language--today there are hundreds of coaches and sports psychologists who appropriate his insights and terminology everyday. Here you can see Jim's complete system, presented by the master himself. It's awesome. I know from my personal experience, and you can too. 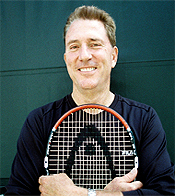 Allen Fox is unique in tennis coaching, because he not only played at the highest levels of the game, he backed that up with a PhD in psychology from UCLA. That's an accomplishment I doubt will be equaled by any modern pro player. One of the fascinating aspects of this section of Tennisplayer is reading his work and seeing how it compliments, and also at time challenges, the perspective created by Loehr. Alistair Higham is the most important new voice to appear in the field since Loehr and Fox. His work on momentum is truly original, unlike the work of so many coaches who are parroting the insights of others. Based on years of keen observation on the international tour at both the professional and junior level, Alistair's work allows us to comprehend the powerful but hidden forces that control virtually all competitive matches--and most interestingly to learn to how influence and/or shape these forces.